April 24th 2013, morning, the nine storied Rana Plaza in Savar near Bangladeshi capital Dhaka collapsed, it took at least 400 lives, around 2500 survivors were rescued alive and around a thousand more are missing. If we look into the facts that are related to building construction in Bangladesh and this incident we will have to connect a few dots here. To make a building in Dhaka area (the boundary covers nearby suburbs and towns beyond Dhaka metropolitan, thus it covers the incident area Savar) the owner needs to take permission from 13 different organizations (along with the main authority RajUK) to get the permit of construction and approval of architectural design (and in case of large projects, structural and other designs), it includes municipality, environment department, fire service, electricity and gas distribution authorities etc. Apparently RajUK coordinates this whole approval process with all the organizations. During the construction, the overall responsibility of checking if the construction is done according to approved design is also the duty of RajUK and all other related organizations. In case of building a factory you need to take a few additional approvals from factory building related authority and if it is a garments factory then you also need license and approval of the non-government organization BGMEA an association of garments owners that regulates the garments business in Bangladesh. 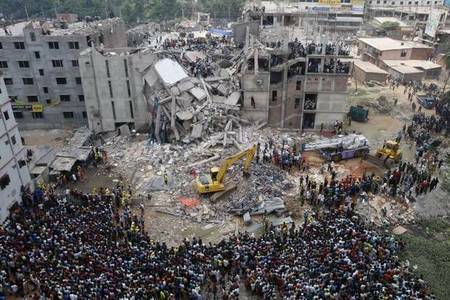 If corruption plays any role at any point in this process, incidents like the collapse of Rana Plaza and fire at Tazreen Garments may happen any time. And many of these organizations are infamous for institutionalizing corruption. Allegedly often these paper works are done or overlooked by political influences and bribe. Particularly in case of Rana Plaza the problem might have happened in many different layers. Allegedly the building was designed to be 6 storied, the owner made additional 3 floors without permission. It was the duty of the local authorities to prevent the owner from doing that at the first place. There could be fault in the structural design. Then the usage of the building, it was architecturally and structurally designed as a commercial complex, for small shops and offices. The dead-load and live-load of garments factories are far more than commercial buildings, counting the number of people per sft and the weight of the heavy machinaries. So even if the initial structural design was ok as a commercial building, using it as garments factories might have made the structure fail. It is difficult to tell what exactly happened without extensive engineering investigation. It was also the responsibility of architects and engineers who worked for that project in whatever phases to check it's legal status. So clearly all the organizations that let the owner make this building without following the rules and let them use it for unapproved purpose are responsible. Of course along with the building owner, the owners of the garments factories for doing accepting all the corruptions related to building construction and it's usage. And particularly they are responsible for forcing the workers to go inside that building that day even after knowing the warning. The troublesome fact of all is the paradoxical existence of the two big authorities RajUK for building construction and BGMEA for regulating garments industry. RajUK has it's own real estate business, they sell land and apartments and they are also the authority of regulating building construction and real estates, that's contradictory. A single organization can't run a business and also be the regulatory body of it. Similarly BGMEA is a garments owners' association, it is easily imaginable what may happen when all the regulatory authority and duty of looking after the welfare of workers remain under the owners' control. So Bangladesh need separate independent commissions as the regulatory authorities of building construction and also the garments industry﻿ to reduce unethical practices and corruption. We hope those efforts be successful and the laws be enforced properly to prevent tragedies like Rana Plaza and save human lives. Metropolis, the renowned magazine of Architecture & Design has announced its 9th annual design competition. This prestigious event trails back to 2003 with a view to promote environmental activism, social involvement, and entrepreneurship in young designers. This year they have challenged the designers to develop solutions that empower, advance, and include the groups that are often overlooked in the design process. For example take our rapidly increasing aging population and citizens with disabilities. The form is up to the applicants, considering how people are becoming attached to technologies and what devices, materials, and modes of transportation will stay relevant 20 years from now. Keep in mind what other groups will benefit from the design. It’s hard to think about 1.13 billion people’s unique problems and solutions, and to make it easy for the designers, you can consider your mom, your dad, your uncle or aunt, your friend, your kid brother or sister, your grandparents, any of your relations with special needs. The proposals should also respect the core values of good design—incorporating systems thinking, sustainability, accessibility, materials exploration, historic relevance, and technology—while forwarding our thinking on what designers can accomplish. Eligibility The competition is open to any Designer and Architect in practice for 10 years or less, as well as design students. Collaboration between inter disciplinary personals like architecture, urban planning, landscape design, interior design, product design, and graphic design are encouraged. The entry fee is $75 for each submission. Up to three submissions will be accepted from an individual or team of collaborators. A separate application and entry fee is required for each project submitted. Deadlines All entries must be submitted by February 18, 2013 at 11:59 p.m. EST. Awards The $10,000 prize is intended to support designers whose entries reflect considerations of inclusive design, systems thinking, sustainability, materials exploration, progressive technologies, function, and provocative form.